Offering you a complete choice of products which include 125 amper current collector, heavy duty current collector, 20 amp current collector, crane current collector, crane current collector carbon brush and 125a current collector copper shoe. 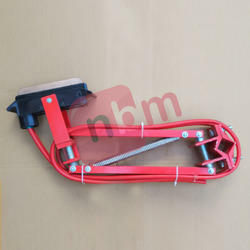 We are Manufacturer and Exporter of Crane current collector for DSL conductor shrouded bus bar in W-Type,V-type,Angle Type in Various ampere capacity 20Amp, 100Amp, 125Amp, 250Amp,400 Amp, 600Amp, 800Amp & 1000Amp. Current Collector assembly consists of a spring Loaded sliding contact type shoe of sintered copper graphite, Heavy duty double arm current collector provides multi axis degree of flexible movement. We are Manufacturer and Exporter of Crane current collector for DSL conductor shrouded bus bar in W-Type,V-type,Angle Type in Various ampere capacity 20Amp, 100Amp, 125Amp, 250Amp,400 Amp, 600Amp, 800Amp &1000Amp. 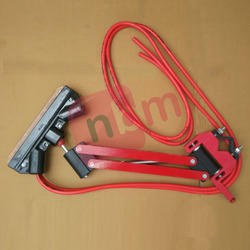 We are Manufacturer and Exporter of Crane current collector for DSL conductor shrouded bus bar. Current collector are available in different ampere capacity 20Amp, 100Amp, 125Amp, 250Amp & 400 Amp. We are also manufacturing Current Collector For angle type MS DC DSL bus bar in different Current capacity 250Amp, 500Amp, 800Amp & 1000Amp. Current Collector assembly consists of a spring Loaded sliding contact type shoe of sintered copper graphite, Heavy duty double arm current collector provides multi axis degree of flexible movement. Exposed parts of current collectors shall be grounded and of corrosion-resistance material. 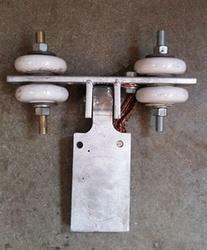 Current collector assembly shall be designed to operate through gaps, splices, switches and shall be self-centring. NBM offering DSL Current Collector assembly consists of a spring loaded sliding contact type shoe of sintered copper graphite. 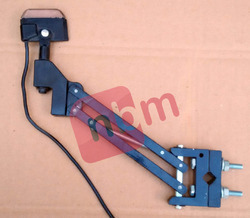 Heavy duty double arm current collector provides multi axis degree of flexible movement. 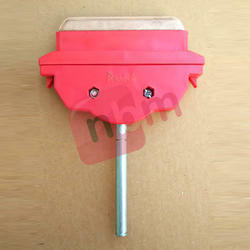 Exposed parts of current collectors shall be grounded and of corrosion-resistant material. Current collector assembly shall be designed to operate through gaps, splices, switches and shall be self centring. 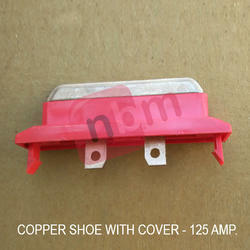 Copper Shoes OR Copper Shoe with holder is also supplied as a spare component for Current Collector assembly. We manufacture various types of current collector like single hinged, double hinged ,dsl ,gravity type current collectors are used to tap power supply from down shop leads to the moving crane. 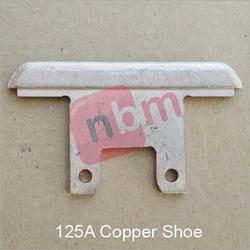 These current collectors with cast iron shoes will slide on the top of the angle iron type DSL system.